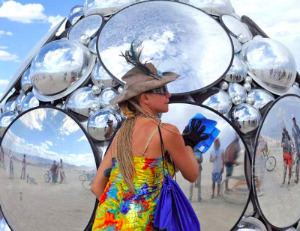 * Huffington Post, September 2015: Art Highlights at Burning Man 2015. * ArchiPanic, August 2015: Architecture/design magazine Archipanic with feature on Compound eye/I. * MoMA blog : Post featuring (In)Visible on the Museum of Modern Art's blog "MoMA Talks"
* Visual News, October 2014 : Interview about the challenges of creating art in the desert, the focus on 'reflective' materials. * Installation Magazine: Detailed photo-essay/article featuring (In)Visible's installation process at Burning Man. * Ignite Me: In-depth interview with Kirsten about art, inspiration, creativity. * Visual News 2012: " Compound eye/I" and "Compound eye/I Revisited"